WASHINGTON • Mrs Hillary Clinton wants your "vote" for her book, which has had choice quotes seeping out for weeks. "Now I'm letting down my guard" is one quote, but should would-be buyers elect to believe her? In her previous books, she measured her words with teaspoons and sprayed them with disinfectant. Then again, you have been told over and over that she is very different in private. And she is now a private citizen. This distinction seems to have made all the difference. Her book What Happened is a candid and blackly funny account of her mood in the direct aftermath of losing to Mr Donald Trump in the race to the White House. It is a feminist manifesto. It is a score-settling jubilee. It is a primer on Russian spying. It is a thumping of Mr Trump. I sometimes wonder: If you add together his time spent on golf, Twitter and cable news, what's left? "I sometimes wonder: If you add together his time spent on golf, Twitter and cable news," she writes, "what's left?" Winning the popular vote by nearly three million may not have been enough to shatter the country's highest, hardest glass ceiling. But it seems to have put 2,864,974 extra cracks in her reserve. In the run-up to the publication of the book, politicians have been expressing dread, fearing it will be a distraction and reopen old wounds. Are there moments when What Happened is wearying, canned and disingenuous, spinning events like a top? Yes. Does it offer any new hypotheses about what doomed Mrs Clinton's campaign? No. But this book is not just a perseverative recap of 2016. It is the story of what it was like to run for president of the United States as the female nominee of a major party, a first in US history. The best, most poignant parts of What Happened reveal the Mrs Clinton that her inner circle has assured was lurking beneath the surface all along: a woman who is arch, but sensitive. She writes that she is astonished whenever someone else is astonished to discover she is human. Far more controversial and complicated is the rest of What Happened, starting with her arguments about the role of misogyny and sexism in the election. It is hard to buy the idea that she suffered disproportionately from charges of untrustworthiness or inauthenticity simply because she is a woman. More persuasive is her contention that presidential politics, especially compared with parliamentary politics, favours arena-filling showmanship rather than the quieter, detail-oriented realism she prefers. 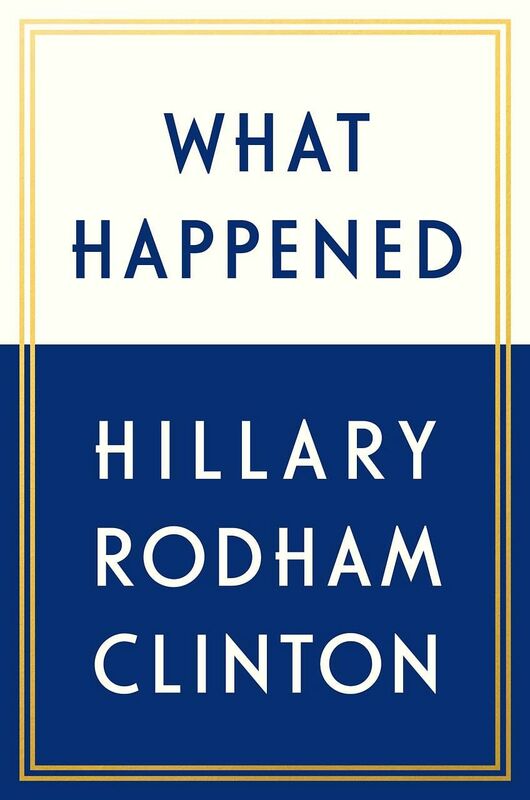 As her book's title implies, Mrs Clinton has her own version of what happened last year and she eventually forces readers to reckon with it. She seems at once the best and worst possible person to carry out this assessment. But here, at any rate, is her bottom line: A letter of Oct 28, 2016, which notified Congress that an investigation was being reopened into her use of a private e-mail server to conduct State Department business, effectively ended her candidacy. Add to it Russian interference - fake news stories on social media and e-mail hacks - and you have the perfect storm. Mrs Clinton also blames sexism, citing a 2014 Pew Research Centre poll that showed just how few voters hoped to see a female president in their lifetime. She blames racism, too, which she considers inseparable from economic anxiety, because her courting of immigrants and voters of colour might have given the impression that she put their economic interests before those of disenfranchised whites. Then there is the ever-present animus towards her, which remains, she writes, something she does not fully understand. Readers will be arguing about these questions for decades. But one thing is certain: History conspired against her. No non-incumbent Democrat has succeeded a two-term Democratic president since 1836 and 2016 was a year when voters were pining for change. In spite of that - in spite of everything - Mrs Clinton still won the popular vote by almost three million. But it did not matter. What happened is, it was not enough.